PyFlex - A open-source program for stress analysis of flexible riser cross sections. 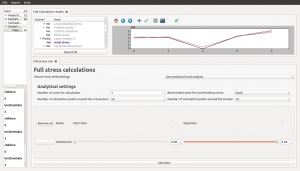 Pyflex is a program for generating stresses in the cross section of flexible risers. Input is time series of pressure, tensions, and curvatures obtained from the global dynamic analyses together with the cross sectional properties. Flexible risers are composite structures made of steel and plastic layers. The assessment of local cross section stresses is usually a computationally expensive task due to their multi-layered composition and complex response when interlayer friction is considered. Traditional fatigue analysis methodology usually employs the minimum and maximum curvature values obtained from regular wave global dynamic analyses. By performing a fast calculation of stresses, the stress transfer function implemented in Pyflex allow the application of irregular wave procedures together with rainflow techniques for the riser fatigue assessment. The program applies the Qt framework through the Python wrapper PySide to make a graphical user interface in which to work. The documentation for the program can be found here, including a theoretical description of the implementation. The source code repository can be found here. A nonlinear constitutive equation based on the modified superposition method has been implemented in a user material subroutine (UMAT) for Abaqus unidimensional applications. A Python application that generates the Fortran subroutine, based on the number of terms and employed in the formulation, can be downloaded here. Download the Python subroutine a href="http://sposs.org/software/umat_nlv_1d/abaqus_umat_nlv_beam_v2.py">here. Edit the file to change the parameters qmax and mmax according to your material fitting. Execute the command "python abaqus_umat_nlv_beam"
Thats it. Your material subroutine is ready to use with Abaqus. A brief theoretical description on the nonlinear viscoelastic constitutive equation employed in the implementation is presented below. which is used for numerical implementation into the finite element package user subroutine. This entry was posted in Material Subroutines and tagged beam, nonlinear, umat, unidimensional, viscoelastic on December 4, 2015 by admin. Bend stiffeners are usually manufactured with polyurethane and used to ensure a smooth transition between the flexible riser/umbilical and the rigid connection at the floating unit. This is a critical region in terms of highest loads and fatigue. BENDFLEX will be based on the beam theory, incorporating large deflections and material non-linearity (hyperelastic and non-linear viscoelasticity) with a graphical user interface. 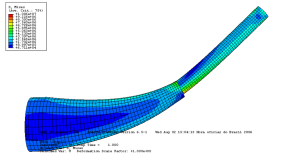 The following features shall be incorporated: a) Parametric study for multiple angle / top tension static loading combinations; b) input of angle and top tension time series for the quasi-static analysis of viscoelastic bend stiffener polyurethane; c) database of typical polyurethane material behavior. Let me know if you want to contribute. This entry was posted in Software on November 12, 2015 by admin. Below you can find the community of end users and developers of the SPOSS initiative. Join us !